. Last edited 10:45 6 Nov 2018. Brazilian liquids production plunged to its lowest in two and a half years in September, falling below 2.6 mb/d and y/y by almost 0.2 mb/d. We had expected a y/y increase, based on the ramp up of four new systems that have come online this year. Crude output fell y/y by 0.17 mb/d to 2.49 mb/d. Maintenance at the Jubarte and Roncador fields resulted in Campos basin output falling to its lowest level since February 2000, to 1.07 mb/d, lower y/y by 0.25 mb/d (19%). The Campos basin production has fallen by a remarkable 40% (0.73 mb/d) since December 2014, and while foreign producers may be able to ease the pace of decline, this will take time and effort. 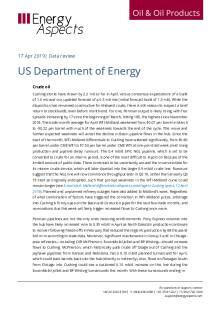 The dramatic declines in the post-salt offset a recovery in pre-salt output, which rose to 1.42 mb/d (+45 thousand b/d m/m) and pre-salt should rise again in October as the 0.15 mb/d P-69 FPSO came online at month-end. We presently forecast 0.3 mb/d y/y growth in 2019. 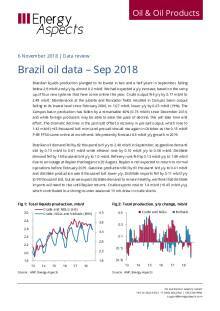 Brazilian oil demand fell by 62 thousand b/d y/y to 2.40 mb/d in September, as gasoline demand slid by 0.13 mb/d to 0.61 mb/d while ethanol rose by 0.10 mb/d y/y to 0.38 mb/d. Distillate demand fell by 16 thousand b/d y/y to 1.0 mb/d. Refinery runs fell by 0.13 mb/d y/y to 1.69 mb/d due to an outage at Replan that began on 20 August. Replan is not expected to return to normal operations before February 2019. Gasoline production fell by 61 thousand b/d y/y to 0.41 mb/d and distillate production was 8 thousand b/d lower y/y. Distillate imports fell by 0.11 mb/d y/y to 99 thousand b/d, but as we expect distillate demand to remain healthy, we think that distillate imports will need to rise until Replan returns. Crude exports rose to 1.4 mb/d (+0.45 mb/d y/y), which contributed to a strong counter-seasonal 13 mb draw in crude stocks.